I don’t know about you but I find pre-holiday prep super stressful. While holidays and travel are incredible experiences, there are so many considerations before you even leave for the airport. There are the practical things of course – visas, outfit planning, booking taxis and trains, researching, decanting your liquids, the list goes on. But there’s also the regular maintenance that women need to plan in before being holiday ready. By this, I definitely do not mean excessive dieting or exercising. I’m so against the notion of being ‘beach body ready’, the only things you need to do to be beach body ready are: have a body and go to the beach. I feel like the media places far too much importance to subscribing to one physical ideal, especially in summer. What I mean by being holiday ready is being able to feel good on holiday, for me this means getting my nails done, using a few facemasks in the lead up, lots of hair masks and of course an appointment with my waxer. A few little treats to make me feel good and look good. On the whole my skin is pretty well behaved due to my rigorous Korean cleansing method, but for the last couple of weeks it’s been looking a bit dull and tired with the odd breakout here and there. Probably all of that pre-holiday stress…! While I normally do a home peel and a couple of brightening and cleansing masks the week before I fly, I felt like I needed something more before I headed to Capri last week. Whilst I’ve had great facials from the likes of Dermalogica and Sisley, they feel like an indulgent pampering treat rather than a treatment, which is what I was after. I didn’t really know what I needed, aside from beautiful skin, so I took to Google and eventually found exactly what I was looking for: the HydaFacial. What piqued my interest is the comprehensive, almost medical nature of the treatment. And it seemed to be just that, a treatment rather than a pampering facial experience including scented candles and a head massage. A HydraFacial treatment consists of six steps to detoxify the skin, remove dead skin cells, extract debris and provide lasting hydration. It’s the detoxing and extracting that sold it to me, after my uncharacteristic breakouts, I felt like my skin really needed to be cleaned and impurities swept away. 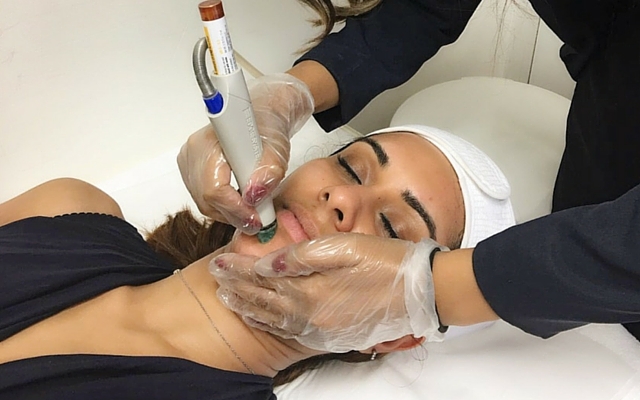 I booked into renowned treatment clinic Juvea Aesthetics, who are based on Harley Street, and initially I wasn’t going to put together a post but after sharing some pictures on Snapchat and Instagram, I was bombarded with questions so thought I’d share my experience. Juvea Aesthetics is just a hop, skip and a jump away from Oxford Circus so it was super easy for me to get there. My appointment was with the lovely Rhian who took me through a consultation and explained the very high tech looking HydraFacial machine – the machine uses a vacuum-based tip which is loaded with different serums to exfoliate and remove dead skill cells while infusing the healthy skin underneath with cleansing, exfoliating and hydrating serums deep down. This is obviously really different to the layering on of product in traditional facials; it’s much more methodical and thorough, ensuring that deeper layers of the skin are targeted as much as the surface layers. Rhian started by cleansing my skin to prepare for the facial the she started using the vacuum tip to start detoxing and removing dead skin cells. The HydraFacial machine has four bottles of potent serums which are used to apply a totally bespoke and personalised treatment, so while the vacuum action removes dirt and debris from the skin, the serum infuses it with nourishing goodness. The extraction process uses glycolic and salicylic acid to gently melt away impurities from the skin’s surface layers plus the vacuum to dislodge and remove impurities from deep down. It’s much gentler than manual extraction and so much more thorough. I only experienced a light sucking sensation from the machine tip, which wasn’t unpleasant in the slightest. Rhian then used the machine to perform lymphatic drainage to help flush out toxins. I use a jade facial roller at night to do a spot of lymphatic massage, which has a huge effect on my face. When I do it regularly, my chin and cheekbones look more chiselled and even my hereditary dark circles look less severe. It’s been a while since I’ve used my facial roller so it was a lovely treat to have lymphatic drainage as part of my HydraFacial. All in all, the treatment took about 50 minutes. After I hopped off the bed, Rhian showed me a container of grey liquid attached to the machine. This was all of the dirt and debris that had been removed from my skin – disgusting and fascinating in equal parts! Not that I needed the proof that the treatment had worked, my skin felt incredibly clean and refreshed as soon as it was over. I don’t think my skin has ever been this clean! The really great thing about the HydraFacial is that there’s zero downtime, so you can leave the clinic and get on with your day. For me, this meant strolling across to Oxford Street for some (more) last minute shopping, albeit much more relaxed and rejuvenated than when I walked in! As with all clinical procedures, please make sure you visit a reputable clinic for your treatments and do plenty of research beforehand. I had my HydraFacial at Juvea Aesthetics on Harley Street and couldn’t recommend them highly enough. Slightly terrified of posting before and after pictures, particularly as my after picture was taken first thing in the morning and I feel very naked without even a slick of concealed or eyebrow pencil..! I wanted to give you a fair and proper comparison though so here you go! If you have any questions, just email or tweet me at Reena_Rai.